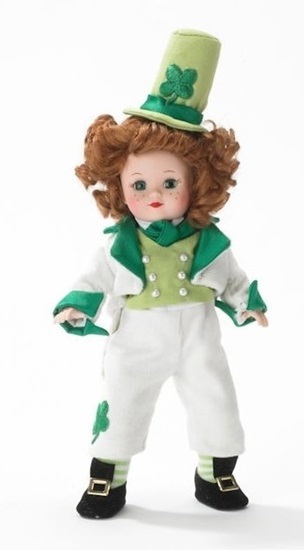 New in 2013 from The Special Occasions Collection by Madame Alexander, we are pleased to present "Lucky Enough To Be Irish", and 8-inch fully-articulated Maggie with green eyes, freckles, and Taffy Tan curls. She is wearing a white corduroy pants suit with cropped legs, a tuxedo jacket that has emerald green satin cuffs, collar and lapels. An apple green faux double-breasted vest, with pearlized buttons, adds a splash of leprechaun flair to her look as does the green shamrock on her knee and the green ascot at her throat. An apple green stovepipe hat with a shamrock and green band, green and white striped stockings on her legs, and black flock "brogues" with gold buckles on her feet completes this lucky look.